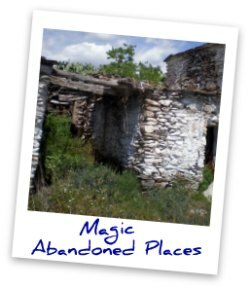 There are many abandoned places in the Sierra de los Filabres , small villages and hamlets, each with its own flair. If the roofs and crumbling walls could talk, we would hear magical stories, lived and listened in the heat of the fireplace. "Los Carrascos", "Las Morcillas", "Los Canos", these are only some of the names of a few lost villages, that used to be inhabited by families with the same name. 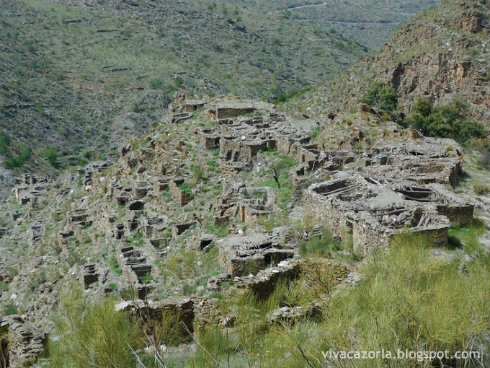 These ruins can be seen from the "Cortijo del Conde", one of our favorite spots, where locals living nearby drive up to collect the much appreciated drinking water. The houses of 'Los Carrascos' crowd together one next to the other. When one family member got married,they just built another small room, adjoining the family home, so they could continue to share the kitchen-dining room. Strolling through the abandoned hamlet paths, I recalled my mother in law's childhood stories. Yes, she and my father in law were were raised in a similar hamlet, in the nearby Sierra la Baza. According to their tales, life was hard and they cultivated the fields for a living. There was no electricity, no radio, no television nor water in the homes. So, while contemplating the ruins, I was calculating... My husband's grandfather, 94 years old, and still in quite a good shape, did actually build one of those houses in Baza. Taking into account that he might not have been the first generation, these hamlets, may well be more than 150 maybe even 200 years old? Hm. And yes, the entire community used to help with the construction. It is a magic place, where fireplaces and cupboards, stables and access stairs, and also scattered antique farm tools, give testimony to a once busy hamlet routine. 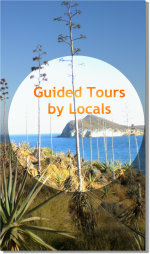 (Ricardo Aparicio conducts hiking escapes to the Sierra de los Filabres!) These places do not appear in any trailing map and thanks to the unique architecture these hamlets achieved to camouflage and adapt to the natural environment, so you will only spot them if you know they exist. The first weekend of April, during which a trip down to Granada was planned, I asked for permission to escape to the Sierras including an overnight stay (thanks to the excuse to take the dog for a walk). 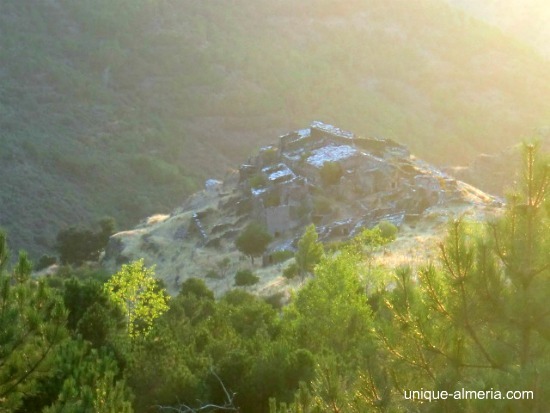 The uninhabited village of "Los Canos", lost in the ravine of "Olapara", is not even outlined in the official maps, although it once totaled more than one hundred inhabitants. The old farmhouses hang up on the hillside which suggests that when parents went to work, they tied their kids at the doors of the houses to prevent them falling into the ravine. I also imagined that, due to the name of the village, it could even have been inhabited by an ancestor or relative. Heck, I wanted to go there. So I left early Saturday morning from Granada to Baza and Sierra de los Filabres. At half past 9 I already was on the trail, which a local had kindly directed me to, in order to avoid as much as possible scrub vegetation and to choose the best path. I arrived very tired, 2 hours later than planned, it was 16:30 and had not eaten anything since 7 in the morning. So I went straight to the bar in Serón where I enjoyed some tapas and beer. The legend of this people is closely linked to mining. During the nineteenth century Almeria Province experienced a huge mining fever. 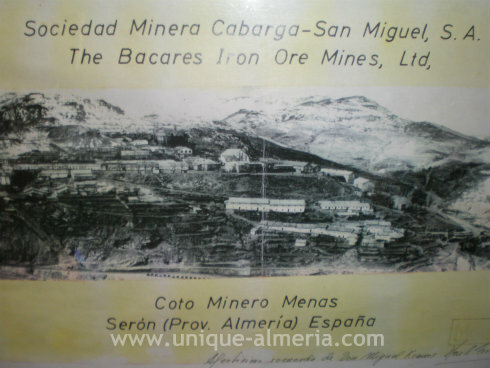 While the iron became gradually more and more profitable and being Sierra de los Filabres, one of the richest area in this mineral, it became the target of many Spanish and foreign mining companies, specially British, Belgian and Dutch ones. In the surroundings of Bacares and Seron one will find more abandoned places. These mountain strips are rich in iron but at the same time quite inaccessible. 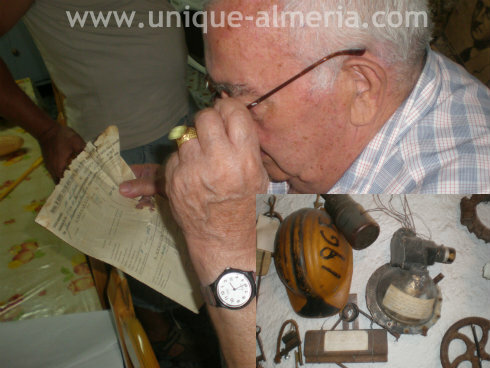 From 1870 mining life emerged and became the main economic resource of the area and one of the largest in the province of Almeria. In the region of "Las Menas" it is estimated that more than 2,500 people used to work there. The hamlet "Las Morcillas", became the home to some of the workers who got up early in the morning to cross the mountains on foot to the mine, their main means of living. In 1970, mining ceased and the mines were no longer exploited. From this moment on the hamlet was a victim of its geographical isolation and the elimination of their only income, which made the inhabitants to abandon their homes. In the nearby village, Seron, we were lucky to meet a local gentleman who still keeps alive the memories of the mining life and the people that used to live there.